I do not know about you, but I am tired of training programs that tell you that the keys to getting bigger and stronger are to keep workouts infrequent so that you avoid overtraining at all costs. Some trainers even recommend taking up to twenty-one days off in between each workout for adequate recovery. Basically the idea is that training should become like a haircut in which you only need to hit the weights once a month. I am sure that many people would love the idea of only having to workout once a month to get bigger and stronger. Hell, most people would like the idea of only having to work once a week to make more money. However, back here on planet earth jobs and training programs that are extremely infrequent will fail for most people. Like any other skill, training takes practice. You have to get good at the exercises that you are using in order to maximize progress. Only naive trainees think that exercises like deadlifts, squats, and overhead presses are easy to learn. Sure, they are easy to learn incorrectly. However, perfecting the drills takes time and lots of practice. There are tons of details for maximizing the benefits of each exercise that can be learned only via experience. Until you get really good at executing the exercises in your regimen, your progress will be average at best. The more often you practice without burning out, the better you get at something. In the context of strength training, getting better at lifting weights equals being able to lift more weight. Add some calories to the mix and the size will follow. It is time to forget about training until you drop, and then taking a week off and looking at training as a practice. Most people cannot afford to not be able to walk for three days after a heavy squatting workout. Fortunately, masochistic training is not required for maximizing training progress. Lets get into what high frequency training (HFT) is all about and how to utilize it to maximize the benefits of training. First, let me start off my saying that I do not think that High Intensity Training is garbage. Training to your limit and taking the appropriate time off to recover works for about 3-6 weeks at a time. After that, you have to switch to something else to continue to make progress. Failing to do so will fry your central nervous system. How do you know when your CNS is fried? Well, when everything feels heavy and you are working harder to lift weights that should feel easier, you know that you are on the wrong track. To really maximize the benefits of a HIT training you have to be really good at the exercises that you are doing. Otherwise your form will get sloppy and the inevitable injuries will follow. Thus, try doing HFT for six weeks before doing a six-week program of HIT and I think that you will be happy with the results. Okay without further adieu lets take about HFT. According to Steve Justa, author of "Rock Iron Steel, The Book Of Strength", many of the old time strongman used to do daily training in order to get stronger rapidly. Now the key with frequent training is to pick the right intensity level. You cannot train to your limit daily or close to it. You will be hitting the same exercises several times a week. Training with the right intensity level will turn every workout into an active recovery session in which each session helps you recover from the last one. However, training with the wrong intensity level will hamper recovery from the last workout and you will be putting the breaks on your progress with each successive workout. The hardest part of frequent training is actually believing that it works. Most of us are used to training with intensity and using soreness the nest day as a measurement of how effective the workout was. Finishing a workout and feeling fresh and energetic is blasphemy to most serious trainees and takes a while to get used to. However, the point of training is to make progress, not to go for the stimulus of training. Save that for the losers at your gym that have been bench pressing 185 for singles for the last ten years. The goal that we are after is maximum proficiency and efficiency to get the most out of our training. Rather than digging a hole into your recovery abilities, HFT will improve your recovery abilities. How is that possible? Your body adapts what you subject it to as long as it is done in a gradual manner. If you are trying to get a tan it is much better to subject yourself to a small amount of sunlight daily rather than a large amount on one day. The large amount will cause you to get burned. The gradual amount will cause your body to adapt without getting burned. The more frequently you can do something without burning out, the better you will get at is and the more progress you will make. You will adapt to what you subject yourself to (within reason of course). Once your body and CNS realize that you are training frequently, adaption will occur as long as the proper stimulus is used. If you get yourself used to taking a week off between each training session, then you will adapt to that. Which is more efficient? Applying frequency and adapting sooner or taking long breaks and taking longer to adapt? I would go with the former. The more often that you can hit a muscle group and recover the faster you will make progress. Next, HFT training works because you improve at the actual skill of lifting weights. When you are trying to learn a new skill such as driving a car or playing the guitar the more often that you practice it the better you will get. Think back to a time when you were leaning a new skill such as riding a bike. Did you practice riding a bike once a week or once a month? If you did then it probably took you a long time to learn the skill. However, most kids who picked up the skill of riding a bike rapidly practiced daily. Many years ago when I learned how to snowboard, I sucked for the first three days. However, by the forth day, my body started adapting and by day six and seven I really started making progress. If I had quit after the first day and tried again a week or more later, it would have been like starting all over again. As hard as it may be for you to believe, lifting weights is a skill just like anything else. The reason why novice trainees make so much progress is due to the fact that they are learning the skill of training. 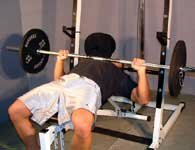 The first time a trainee tries a bench press, he or she does not have the skill set of moving the bar from Point A to Point B in the most efficient manner possible. As a result the bar is all over the place. Watch a professional powerlifter bench press 500 lbs and look at the bars path. Notice how control is maintained through the entire duration of the move. 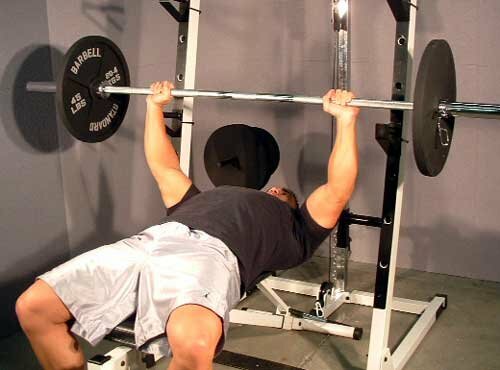 Only an ignorant trainee would say that there is not that much to doing a bench press. All that you are doing is pressing a weight from your chest to lockout right? Wrong, if bench pressing were that easy, then everyone could get good at it and put up some heavy weights. If you want to be able to move some heavy weights around, you have to master the skill of executing each exercise. Until the skill is mastered you will never be as good as you could potentially be. Lets get into how to put HFT into action. HFT involves doing five full body workouts per week. The program that I am going to reveal here is based on the 5x5x5 program that I learned from top strength coach Pavel Tsatsouline. Check out his excellent book "Beyond Bodybuilding" at www.dragondoor.com for more info on that. The program that I have here involves more volume and is designed for rapid increases in size and strength rather than just strength. Lets get into it. I recommend that you train Monday through Friday and then take the weekend off. However, feel free to pick the days that work best for your schedule. Just make sure that you take two days off. How about doing a workout everyday? This is possible and could work very well. However, I think that taking two days off per week is good for a mental break. Waking up every morning and realizing that you have to train that day will get old fast and start to ware on you. Click Here For A Printable Log Of HFT Routine MWF. The first thing that you will notice is that there are not too many exercises in the program. When training frequently you have to be a minimalist. You will have to prioritize on a few exercises that you want to get really good at. What Exercises Should You Pick? Pick exercises that address your weaknesses. 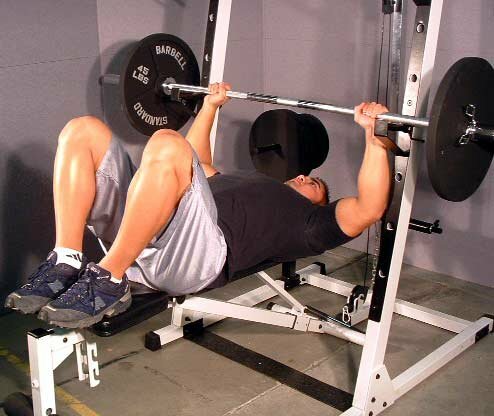 If you have a strong bench press but a weak overhead press, pick the overhead press for your pressing move. 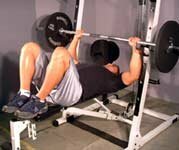 Your bench press will not get weaker and most likely it will be stronger when you bring it back into your regimen. If you are great at doing bent over rows, but horrible at weighted pull-ups, then pick weighted pull-ups for your pulling move. Both the squat and the deadlift work a lot of muscles in the lower body so it would not be wise to do both daily. Again, pick the exercise that requires the most improvement. Use your seven rep max on each exercise and do one set of five repetitions. Take a one-minute break in between each exercise. This workout should feel easy and that is exactly how it should feel. It will take a lot of will power for most trainees to stop at five reps and move on to the next exercise. You will literally feel like you are wasting your time as this approach to training is like something that people would do in bizarre land. Nevertheless, your patience and will power will pay off if you follow the plan and stay on course. In week two, add another full body workout on Tuesday. Thus, now you are doing a full body workout on Monday-Wednesday and then taking Thursday off. Proceed to get Friday's workout in and then take the weekend off. Again, use the same weights that you used in week one. In week three, add another full body workout on Thursday. Now you are doing five full body workouts per week. Due to the fact that you are not training to failure or close to it, you will not be over-training. If you are over-training and feeling weaker from workout to workout, then you did not follow my directions. This style of training takes some getting used to and if you are too myopic to try something different then what the masses tell you to do, then give up and go home. For everyone else, lets move on to week four. In week four, you are going to add another set to each exercise so now you are doing two sets of five per exercise. Take three-minute breaks in between each set and one-minute breaks in between each exercise. Use the same weights that you used for each exercise in week three on both sets. In week five, you are going to add one more set for a total of three sets. 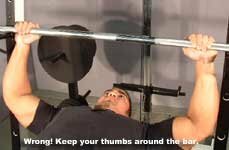 Again use the same weights that you used in week four on all three sets. Take three-minute breaks in between each set and one-minute breaks in between each exercise. Now in week six it is time to increase the weight and reduce the volume. Add five pounds to all of the upper body exercises and ten pounds to the lower body exercises and start over with one set per day done five days per week. Cycle your way back up to three sets per day and then add some more weight. Make sure to get 8-9 hours of quality sleep per night. Supplements such as ZMA and GABA will come in handy to ensure deep REM sleep. Make sure that you diet is in check. If you want to put on weight up the calories and protein intake. A post workout shake such as "Surge" or a protein shake with an ample supply of BCAA and glutamine is a good idea. A pre-workout product such as Powerdrive or Acetyl L-carnitine/phosphatidylserine will keep you sharp for each workout. Try one serving of powerdrive or 5 grams of ACLAR and 400mg of PS.